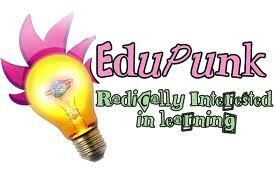 This entry was posted in Edupunk(ed) and tagged Educational Crosroads, Edupunk(ed) Habitual Discomfort, Jim Groom. I do feel that education should be inviting for students, they need to really be the ones who want to learn otherwise they wouldn’t. I believe that through process and things that are hands on and progressive, students will be willing to learn, willing to explore, this is what education is all about. I think that students should also be able to research, and give their opinions and reasons instead of a bland multiple choice answer that shows no background of knowledge but rather a background in good guessing instead. “Ed techs like to claim that the Internet represents a revolution in human communication, one with profound effects on how we produce, consume, share, and value knowledge. That is so true because technology in general is such a hugeee deal and it only grows with time. Twenty years from now things will probably even be so much more different. It’s crazy with what change collaborated with time can bring. Great post. 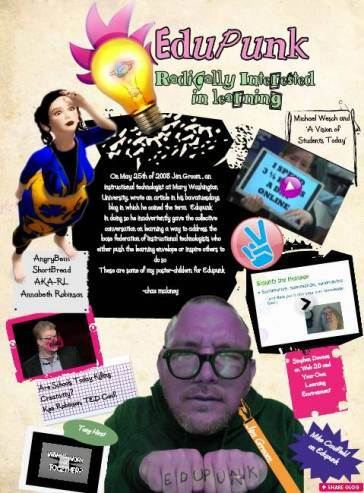 The image above is interesting as well as it’s from a glogster about edupunk which embeds all the original media and links that were used to create the image.